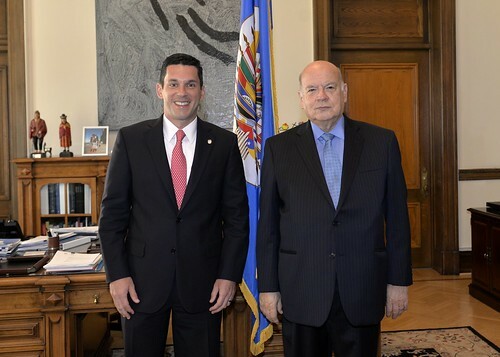 The Secretary General of the Organization of American States (OAS), José Miguel Insulza, today received the Deputy Minister of Foreign Affairs of Panama, Luis Miguel Hincapié, to discuss preparations for the VII Summit of the Americas to be held in the Central American country in April 2015. During the meeting, the two reviewed the logistical, security and thematic issues related to the event that will bring together the Heads of State and Government of the Hemisphere, with special emphasis on areas such as civil society participation and the prospects for the Summit in the political arena. Secretary General Insulza and Minister Hincapié also took the opportunity to review other issues of regional interest, including the OAS Special General Assembly on drugs, to be held in Guatemala next Friday, September 19; the United Nations General Assembly to be attended by Secretary General Insulza next week in New York, and Panama’s leadership in the hemispheric context. The bilateral meeting was followed by a meeting of the Executive Council of the Summit Implementation Review Group (SIRG) which included the participation of Vice Foreign Minister Hincapie, the Secretary General and representatives of the countries that have hosted the Summit in the past (United States, Bolivia, Chile, Canada, Mexico, Argentina, Colombia and Trinidad and Tobago), as well as representatives of regional groupings. During that meeting, Secretary General Insulza reiterated to the Panamanian government "the willingness of the General Secretariat and the member states to work on the preparations for the next hemispheric gathering." The meeting also reviewed logistics and other important details of the preliminary stage of the Seventh Summit. Following the Executive Council’s meeting the SIRG met in its first regular meeting of 2014, chaired by Minister Hincapié, and which included the participation of all member states and during which Panama presented the logo and theme for the presidential Summit: “Prosperity with equity: the challenge of cooperation in the Americas." In this meeting, the OAS leader declared his conviction that in this organizing process, and at the Summit itself, "critical issues for the region will be addressed, in a constructive spirit, respectful of differences and with the benefit of all citizens of the Americas in mind."